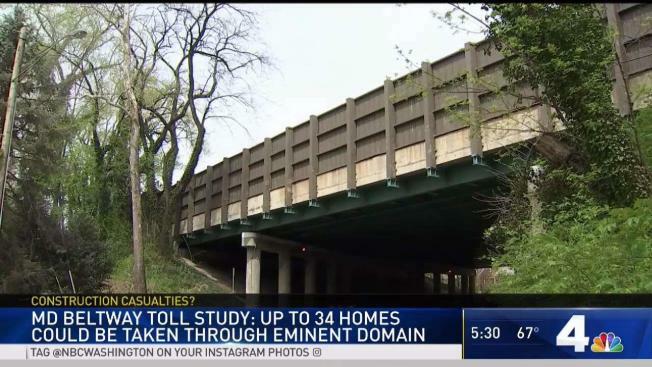 Opposition is growing after an initial study into the possibility of expanding Interstate 270 and the Beltway in Maryland suggested adding toll lanes through eminent domain. That study suggests that the state of Maryland seize up to 34 homes in Silver Spring through eminent domain, the legal process by which the state government could take private property and redevelop it for a public purpose. Maryland is evaluating seven plans to reduce traffic on Interstate 495 and I-270, and nearly all suggest adding toll lanes. The state says all plans would reduce the amount of time that commuters spend in traffic by at least 20%, with some options cutting traffic time by nearly 35%. But residents near the Beltway say the suggestion is unfair. And some point out that following this suggestion would require Gov. Larry Hogan break a promise he made not to use eminent domain. "This is my home," said Osvaldo Montero, a resident who could face eminent domain and be relocated. "It wouldn’t make any sense to rush us to go somewhere else for a road." The Maryland Department of Transportation will be hosting a series of public hearings to receive input from community members. That schedule can be found here.